Mumbai, Metro Rail News: Alstom has been awarded a contract by Mumbai Metro Rail Corporation (MMRCL) to supply CBTC signaling systems for line 3 of Mumbai Metro. The contract, which builds on rolling stock and Power supply contacts won earlier this year for the same line, is worth over euro 100 million. Alstom will equip Line 3 with Urbalis 400, its latest generation of CBTC signalling technology. The scope of the contract includes unmanned train operation (UTO), computer-based interlocking and centralized train supervision, platform screen doors, as well as the electrical and mechanical supervisory control and data acquisition system (E&M SCADA). “Alstom is extremely proud to have won three big contracts for Line 3 of Mumbai Metro, emerging as the partner of choice for this prestigious project. This major signalling contract confirms the trust our customer MMRCL has in us. This is an excellent opportunity for Alstom to showcase its breadth of expertise and reinforce our goal of being the preferred partner of cities, countries and operators as they face the rapidly evolving challenges of urban mobility,” said Alain Spohr, Alstom Managing Director India and South Asia. Urbalis 400 is an advanced communication-based train control signalling system that will help ease Mumbai’s commuter congestion. Urbalis 400 boasts a proven service record in over 30 cities across the world. Constantly upgraded, the solution aids urban operators in maximizing their performance and capacity while requiring standard interlocking for their operational needs. Designed specifically for heavy ridership metros, the system offers a considerable range of functions that improve headway and average speed performance. Alstom’s Urbalis radio CBTC track record spans more than 15 years, 96 urban rail lines (over 55 are in service), 1900 track miles, 1100 stations, 1800 trains and 24 countries worldwide. Over 25% of the world’s radio CBTC systems are operated with Alstom’s Urbalis solutions. In India, Alstom has pioneered the introduction of CBTC by deploying Urbalis in the Kochi and Lucknow metros. Earlier this year, Alstom won two contracts for power supply and the provision of 248 metro cars for Mumbai Metro Line 3. 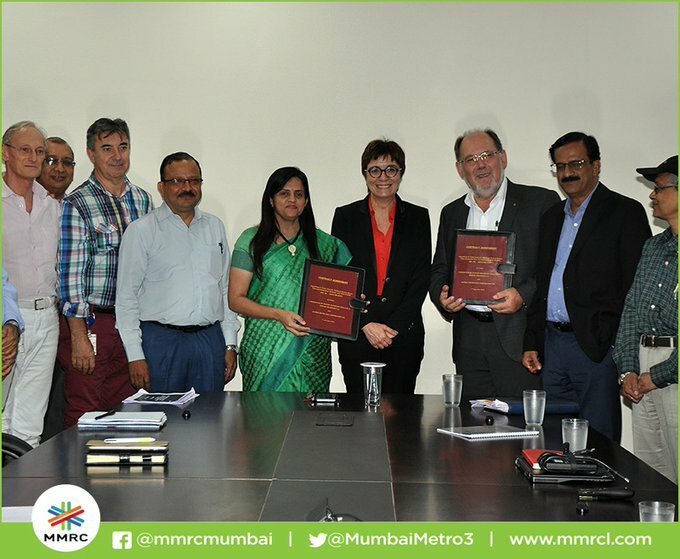 The contract was signed by Alain Spohr, Managing Director, Alstom Transport India & South Asia on 7th December 2018 in presence of Ms. Ashwini Bhide, Managing Director of Mumbai Metro Rail Corporation and other officials. The Mumbai Metro Line 3 is a 33.5-km long underground stretch connecting the busiest and congested regions in Mumbai – one of the fastest growing cities in India. The metro line will connect Cuffe Parade business district in the extreme south of the city to SEEPZ in the north-central with 26 underground and one street-level station. Line 3 will be the first underground metro line in Mumbai and will be one of the biggest underground continuous stretches in India.